The U.S. economy grew an annualized 3.5 percent in the third quarter. While this reflects some easing from the 4.2 percent growth rate in the second quarter, it continued to indicate solid expansion overall. 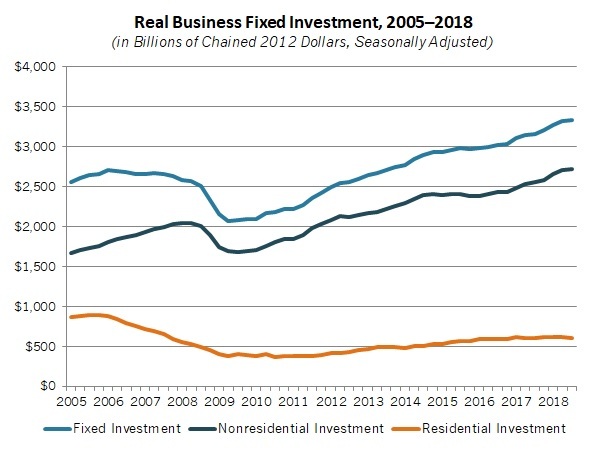 Consumer and government purchases, along with robust spending on inventories, helped to buoy economic growth for the quarter, with notable drags from net exports and the housing market. Moving forward, the current forecast for fourth quarter growth is 2.8 percent. Real GDP should grow roughly 3 percent in 2018, which would be the strongest growth rate since 2005, and growth in 2019 is predicted to be 2.5 percent. In a speech at The Economic Club of New York, Federal Reserve Chairman Jerome Powell said the Federal Open Market Committee (FOMC) had “no preset policy path,” with future monetary policy decisions hinging on incoming data. Financial markets reacted favorably to his comments (and those from Vice Chairman Richard Clarida) on the assumption that the Federal Reserve might pause on rate hikes at some point, particularly if it sees some softening. The minutes of the prior FOMC meeting also seemed to confirm that thinking. With that said, the FOMC is still widely expected to increase the federal funds rate by 25 basis points at its December 18–19 meeting. His comments, if anything, have more to do with the number of possible rate hikes for 2019. The FOMC did get some encouraging news from the latest inflation data. The personal consumption expenditures (PCE) deflator—the Federal Reserve’s preferred inflation measure—rose 0.2 percent in October, with 2.0 percent growth over the past 12 months. Excluding food and energy costs, core PCE inflation fell to 1.8 percent year-over-year in October, indicating some moderation in pricing pressures over the past few months. Personal spending jumped 0.6 percent in October, the fastest monthly pace since March and a sign that American consumers stepped up their spending leading into the all-important holiday season. (Along those lines, holiday spending has been quite robust so far, especially on Cyber Monday.) More important, personal spending has risen a robust 5.0 percent over the past 12 months. For its part, consumer confidence eased somewhat in November but remained not far from its 18-year high. In other news, manufacturing activity decelerated in both the Dallas and Richmond Federal Reserve Bank districts in November, but the outlook for the next six months remained quite positive. Meanwhile, residential construction data continued to disappoint, with new home sales plunging 8.9 percent in October to the slowest pace since February 2016.